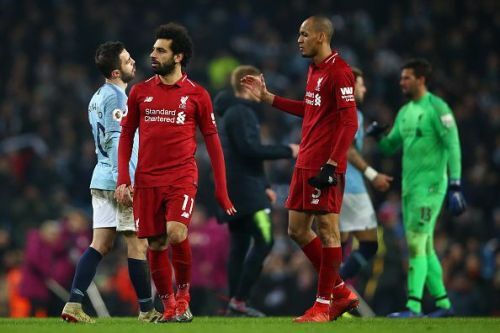 Liverpool tasted their first league defeat of the season as they were beaten 2-1 by Manchester City in their Premier League fixture at the Etihad Stadium. The Cityzens started the game strong and were all over the Reds from the very first whistle of the game. Their pressure proved too much for Liverpool to handle and Sergio Aguero scored a spectacular goal in the 40th minute of the game to give his team a one-goal advantage. Liverpool came back strongly after the half-time break and equalized the scoring through Roberto Firmino in the 64th minute of the game but Leroy Sane got clear of the Reds' defence just eight minutes after the Reds' to slot the ball past Alisson to restore his team's advantage. Jurgen Klopp's men tried hard to come back in the game after going down but the Cityzen's defence stood strong and didn't let their title rivals equalize for the second time in the game. Manchester City enjoyed 49% of possession during the game and had nine shots on goal as compared to Liverpool's 7. Pep Guardiola's team is currently second on the Premier League table, four points behind the leaders Liverpool. They will play Rotherham and Burton for the Cup fixtures next before having games against Wolverhampton Wanderers and Huddersfield Town respectively in the league. On the other hand, Liverpool missed the opportunity to go 10 points clear in the Premier League table and are now just four points ahead of Manchester City. They will play Wolverhampton in the FA Cup third round next before having games against Brighton and Crystal Palace respectively next in the league. Football fans reacted to Liverpool's league defeat of the season on Twitter and here are some of the best tweets. Liverpool: "We are Liverpool, YNWA, Unbeaten in 752 games this season, we are going to be 10 points clear tonig..."
Manchester City or Liverpool: Who is having a better season based on stats? Manchester City vs Liverpool: A potential title decider?